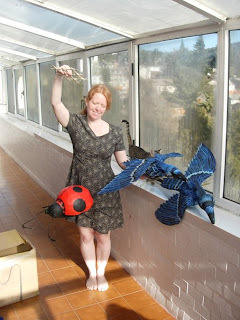 This is me with two of the blue jay puppets and the ladybug. 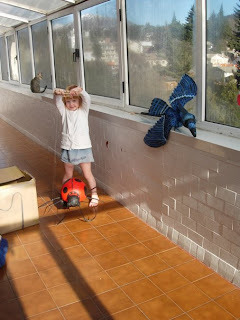 This is Naomi with ladybug. 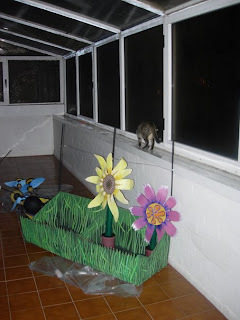 Here's the flower bed with two of the flowers that grow and hook onto the wire. 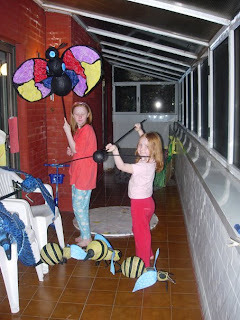 And Chloe holding up the butterfly with Phoebe holding the bees. I've been getting some e-mails from different people who are interested in moving from the States to this region. That's great! As Jackie O said, you owe it to yourself and the rest of the world to do what makes you happy. Most of the misery in this world is caused by unhappy people. Some questions included the cost of living, the quality of schools and some other concerns that I will try to address. Let me just say, if you don't know any spanish, get started. It's a catch -22, the best way to learn a language is to live in a country where it is spoken, but the only way to feel really comfortable in a country is to speak the local language. First of all when you arrive here to rent an apartment avoid the following months; December-February, and June-August. This is high season and you will pay through the nose trying to rent at these times. As for food, $200.00 (pesos) worth of groceries is about the same as U$S 200.00 of groceries in New York ( if you know the exchange rate, you'll find that's a great deal), gas here is $2.069 (pesos) a gallon at the YPF, and tuition at my kid's bilingual school is U$S 500.00 a month, for all three of them combined. Some parents may be concerned about sending their kids to an english as a second language class, but for my girls it's been an opportunity to help out their friends after a difficult morning in all their spanish subjects. For Chloe in particular it's been great as her english teacher is from Sydney, Australia, and she's learned a lot about Australian life and culture. Her class even tried vegemite, (only Chloe liked it), and a number of other Australian treats. I've been meaning to post some photos from our trip to Buenos Aires. It's such an incredible city and I can't wait to go back. The pictures don't really do it justice, perhaps next time though, hasta luego!